The TC¢Helicon VoiceTone Harmony-G is a studio-quality vocal harmony effects pedal designed for guitar players. The Harmony-G pedal takes the need for programming completely out of the equation, since your guitar playing tells Harmony-G what notes to harmonize. Adaptive mixing and harmony arrangement algorithms follow guitar and voice, and produce realistic harmonies without pre-programming. A guitar AutoMix function provides acoustic guitar players with a balanced mix of vocals, guitar, and effects. The VoiceTone harmony-G pedal's straightforward controls enable you to go further and arrange voicing and effects changes in your songs by stepping through 10 presets with A/B settings as you perform. VoiceTone Harmony-G also features XLR mic level I/O, a guitar input, and pass-thru for separate amp and guitar tuner inputs. Each effect pedal in the TC Helicon VoiceTone line has a unique purpose, yet they complement each other perfectly. Their studio-quality sound, ready-for-action construction, and unobtrusive size let you carry TC Helicon VoiceTone pedals with your favorite mic to the gig, whether it's a club or a concert hall. And operation couldn't be easier. You'll get the sound you want in seconds, instantly boosting your performance the very first night you use a TC Helicon VoiceTone pedal. Up til now, only the most successful singers could take their producer, live engineer, back-up singers and vocal coach on the road. Now it's your turn to bring your vocal posse with you and ensure that your message, and your sound are heard. Quality is discernible in every aspect of TC Helicon VoiceTone pedal design. Studio-caliber audio algorithms, transparent converters, and fastidious analog audio design lead to a smooth sound that makes you sound your best. It just wouldn't be enough to make a product that helps you sound this good without making sure it can stand up to rough treatment onstage or in the studio. 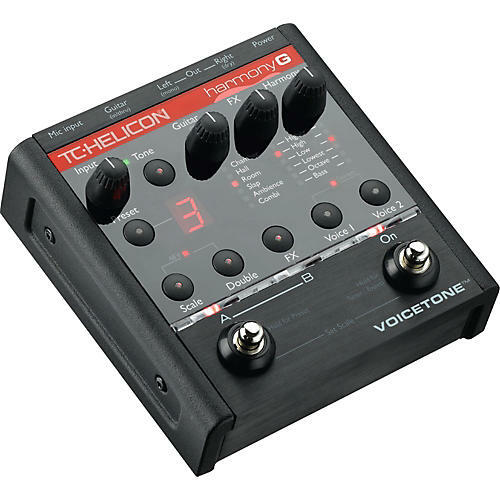 TC Helicon designers gave the VoiceTone Harmony-G vocal effect pedal sturdy construction to survive being moved and stepped under conditions found on the road.